Wheelchair exercises are designed for people with limited mobility to get the full benefit of a fitness routine. 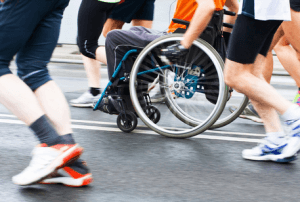 By adopting a creative approach, wheelchair exercises can help you overcome your physical limitations with a variety of enjoyable new ways to exercise. Cardiovascular: Also referred to as the abbreviated “cardio”, this includes exercises that raise your heart rate for an extended period of time. Strength: Includes exercises that involve the use of weights and other types of resistance training, designed to build muscle and bone mass. Flexibility: Includes exercises that help to improve your range of motion — such as stretching and yoga. Before beginning any type of exercise routine you should always speak with your doctor and get their medical clearance. In addition, they may be able to suggest specific types of exercises you should focus on, and which you should stay away from. Since sedentary lifestyle are common in people with disabilities or long-term injuries, it’s important to make exercise a part of your regular weekly routine. If it’s not physically possible for you to meet those recommendations, do as much as you feel comfortable with. The important thing is getting some kind of regular physical activity. If you can, when performing wheelchair exercises try to use a chair that keeps your knees at 90 degrees when seated. If in a wheelchair, secure the brakes and ensure the chair is immobilized. Sit up straight while exercising, use your core (ab) muscles to keep good posture. With that in mind, you’re ready to begin. Here are some suggestions for wheelchair exercises broken down by the three types listed above. A series of repetitive movements while seated will raise your heart rate, burn calories, and also help to loosen up stiff joints. With a lightweight resistance band wrapped under your chair, you can perform rapid resistance exercises as a form of cardio exercise. Try starting with chest presses for a count of one second up and two seconds down with 20 to 30 reps per exercise. If you have some leg function, many community pools and health clubs offer pool-therapy programs for wheelchair users. Some gyms offer wheelchair-friendly cardio machines that allow you to do arm-bicycling and rowing. Most of the traditional upper body exercises can be done from a seated position. All you need to have on hand is dumbbells, resistance bands, or anything else with weight that provides some kind of resistance. Shoulder presses, bicep curls, and triceps extensions. Aim for two to three sets of 8 to 12 reps for each, adding weight as necessary. Use resistance bands for pull-downs, shoulder rotations, and arm and leg-extensions. Follow a similar routine as noted above. Our recommendation for a tremendous flexibility exercise is wheelchair yoga. This can help increase flexibility, improve your range of motion, and reduce the pain in your muscles that results from long periods of sitting. For more information about wheelchair exercises, see our article about wheelchair yoga.